This is a 2 part series running on November 5th and 13th. One of the most difficult skills to master, no matter how brilliant the entrepreneur, is the ability to communicate effectively to an audience the essentials of the company’s existence. Every stakeholder, from customer to investor to employee, needs to be captivated by you and your company. The quality of your pitch is what lands meetings with potential clients and investors. It generates new opportunities. It’s can also be the difference maker in landing amazing talent to join your team. 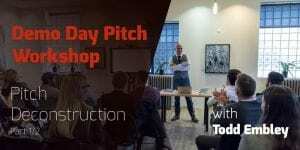 coLab is proud to present this 2-part workshop on how to construct and then deliver a “demo day” style presentation. The “demo day pitch” is the most audience-centric pitch of your startup you’ll ever give. If you’re lucky, it’s to a room full of investors. Luckier still, you’re on stage at TechCrunch Disrupt getting both funding AND PR. Your audience isn’t opening an investor ppt in their inbox, they’re buying a ticket to a performance. The pitch deck augments the story, not the other way around, and should be graphically complementary rather than descriptive. The goal is to inspire the audience to seek you out after the show, excited to know more. The goal is to get a meeting; anything more and your only handing your audience ammunition with which to shoot holes. The demo day pitch is used by world-renowned accelerators such as YCombinator, TechStars, 500 Startups and Chinaccelerator, as the finale showcase of each batch. And even beyond the convention floor, the foundation and process of pitch development extend to every vertical of business – even for brick-and-mortar businesses. Whether its an investor, the bank, the customer or your partner, you will need to both sell and defend your company’s place in this world. In the first session we’re going to go through all the slides you’ll need and all the slides you won’t, and discuss the reasoning behind each. This is the where we take the elevator pitch, expand it, mix in some data, flex our industry and competitive knowledge, and even do a little bragging about ourselves and our team. And of course, we end with an ask. We’ll also look at each slide through the lens of the investor, and how you can get through it all in just 5 minutes. We’ll close with some tips around the design of the deck so that it emphasizes and augments the story without detracting from you, the presenter. You’ll then receive the deck used in the workshop to start building your own. Light lunch and a beverage will be provided. Please inform us in advance of any allergies. This second session is about pulling it all together and giving it a shot in front of actual human beings. Each person or team will be asked to give their presentation where the entire group will be encouraged to discuss what they liked and one thing that can be improved. We’ll discuss both the presentation and the slides in a positive and reassuring atmosphere that is only designed to support and encourage. Each attendee will receive a video recording of their pitch and notes on the presentation itself, with 4 days to prepare for pitch night. This is the scary part. Now you need to stand in front of a group of people and take them on a journey that makes the listener want to write themselves into the story! And hopefully, after a few follow up meetings with you and your team, they’ll want to write a cheque as well. The pitch night session is where we’ll focus on your delivery, stage presence, timing and deck design. All in a friendly and encouraging environment with a small panel of seasoned entrepreneurs/investors to give some high-level thoughts as well. We welcome everyone to attend, however we will ask that you have a business that you would like to work on presenting. If you have a work in progress, even better. An existing business with a deck you’ve been using to pitch investors already? Let’s make it perfect. Todd is a serial entrepreneur who is well versed in VC, startups, community building and accelerator programming and operations, at a global level. He spent 8 years in China, first as an entrepreneur then with SOSV’s Chinaccelerator where he was Program Director for 4.5 years. There he vetted more than 3000 applications, working with more than 75 graduating companies and 300 founders. He led Chinaccelerator to become not only the #1 accelerator program in China, but also the world’s #1 seed investor in female-led startups. Todd has been a speaker at StartupFest in Montreal; East Meets West in Honolulu; Global Accelerator Network partner conference in San Diego; BREAK in Bali, Indonesia; START Summit in St. Gallen, Switzerland; LIFT conference in Geneva; DreamPlus in Seoul, Korea; Global Mobile Internet Conference in Beijing; TEDxSuzhou @ SuzhouU; and GSMA Innovation Labs in Shanghai.